Halloween has been dry and the first day of November will likely be a mainly dry day. Things will change Tuesday night and through the day on Wednesday, though. 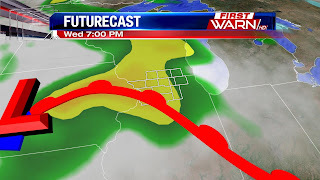 A frontal boundary will essentially stall out over northern Illinois and southern Wisconsin Tuesday and waves of energy will ride along it into Wednesday. Those waves will support rain and potentially some thunderstorms late Tuesday night through Wednesday afternoon. It's rainfall that is needed with October ending roughly 1" below normal. In addition, most of the rain will fall Tuesday night and before lunchtime Wednesday, so many outdoor activities won't be affected too terribly much. Rainfall totals could exceed 1" in many locations, but the more concentrated and heavy rain will likely be along and south of U.S. 20. A tool meteorologists use to analyze how much moisture is in the air is the precipitable water variable. For this time of year, values over 1" (PWATs over 1") are considered very high. Wednesday's PWATs will approach 1.5"! That is nearly record territory. As a result, some moderate to at times heavy rain is possible. However, severe weather is NOT expected, nor are flooding rains. A great Halloween forecast on deck for you today, though the afternoon will feature great cape weather! 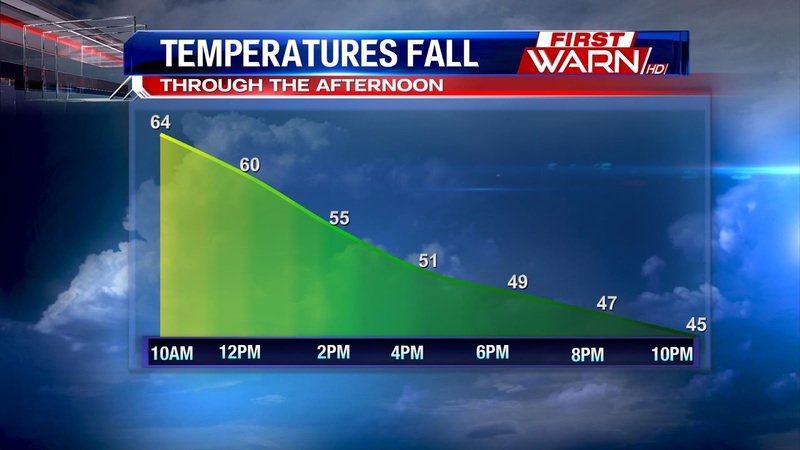 Temperatures will climb to right around 60° this afternoon but it will be a bit breezy. We'll have gusty southeast winds at 5-15 mph and gusting to 25 mph under partly sunny skies. 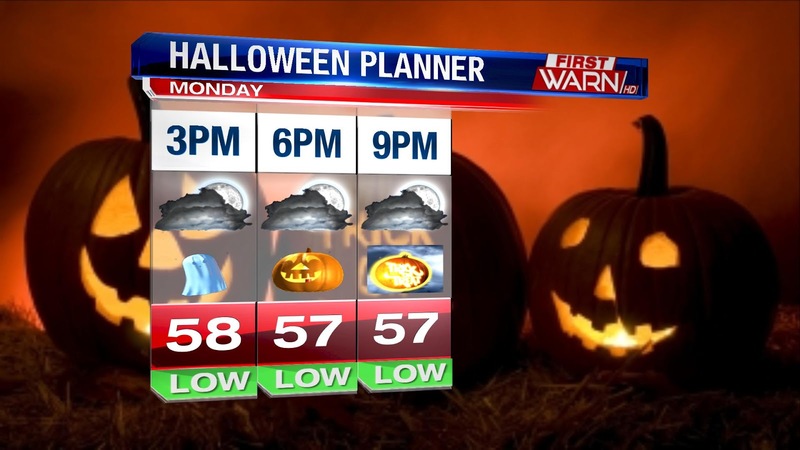 By the time the kiddos want to head out for trick or treating around 5pm, temperatures will still be in the upper 50's. Upper 50's is where we stay for most of the evening. A warm front will pass around midnight, and that will warm temperatures overnight. It's not uncommon to be in the 60's for Halloween, over the years Rockford has had 26 years between 60-69°. But typically it's cooler than that, we've spent a majority of the holiday in the 40's and 50's. While this year will be mild, we are no where near the record temperatures, in 1950 Halloween was a hot one! Highs topped out in the 80's; 84° to be exact! The coldest Halloween featured highs right at freezing; 32° in 1917! The big day is just around the corner and it looks like our weather is going to cooperate! A warm-up is on the way and our temperatures on Monday will move above normal again to 60 degrees for a high, 4 degrees above the average. It will be a bit breezy though with winds out of the Southeast at 5-15 miles per hour and we could see some gusts above that - so hold on to your candy bags! 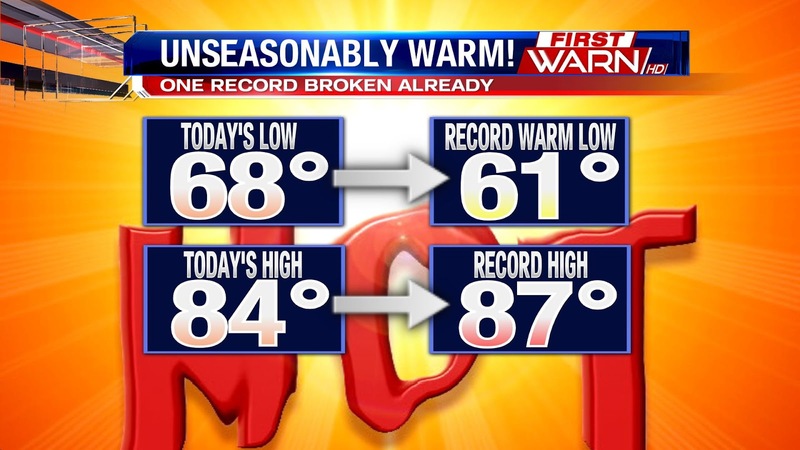 Even though we will be warm, we are not going to threaten the record. The record high for Halloween in Rockford was set back in 1950 when we hit 84 degrees! At 3 PM, when many of the younger trick-or-treaters go out, it will be about 58 degrees under partly sunny skies, temperatures might drop another degree or two as we head later in the evening, but then the they will hold as a warm front is poised to move in from the west. One record we will be close to is the record high minimum of 62 degrees set back in 1974. We will be close at 57! Tuesday looks even warmer as we will likely head back into the 70's! The warm trend continues . . . Enjoy your Halloween. 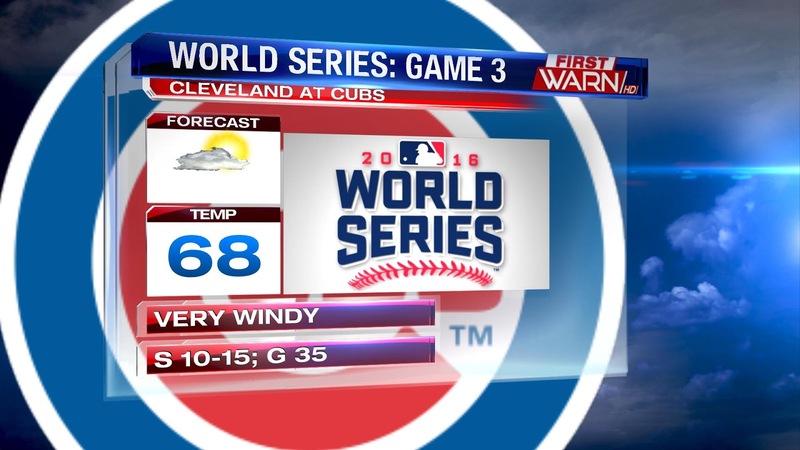 Certainly more mild tonight for the Cubs Game 4 of the World Series Tonight, when compared to the first couple of games in Cleveland. Winds will be out the Northeast at 5-10 MPH which should limit the amount of homers hit tonight. There is also a chance of showers tonight - it looks like the showers will hold off until after the game - but we will have to watch. Tomorrow night's game will be a different story with much cooler temperatures - right around 49 degrees at game time. The winds will again be out of the Northeast. The Cubs have played well this year under all conditions, so hopefully this all leads to 2 more victories before they head to Cleveland to close out the series! Have a great night. Rainy and Potentially Stormy Weekend? It was dry on both Thursday and Friday, and things will be dry for much of the day Saturday. The forecast changes by late Saturday evening and Saturday night as a cold front approaches from the north. 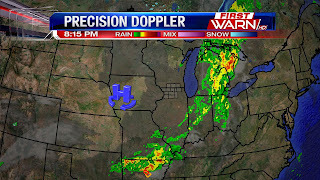 That front will support the development of some scattered rain showers in far northern Illinois into Wisconsin. Much of the activity will hold off until roughly midnight. As Futurecast shows to the left, there is not much rain showing up across the area. The coverage of rain showers will not be very impressive. In addition, rainfall totals do not look to be overly concerning. The Futurecast model we use here in the Weather Center only depicts three-hundredths of an inch of rainfall in the bucket by Sunday morning. While that likely is a little below what will fall, it represents the fact that there likely won't be much in the way of heavy or concentrated rain. It wouldn't be completely shocking to see many backyards avoid the rain shower activity completely Saturday night, especially folks to the south and west of Rockford. The other aspect of Saturday night's rain shower threat is the potential for thunder and lightning. That is due to small amounts of instability that will be in place along and ahead of the incoming cold front. Instability can be referred to as "food" for thunderstorms to use to maintain themselves. With even minor instability in place (as shown to the left) there could be a few rumbles of thunder with any of the strong showers that develop and slide through the area. We dry out by early Sunday morning and remain dry into the middle of next week. Well, if you aren't a fan of cooler and cloudy weather, the upcoming week will feature plenty of weather right up your alley. For the next week or so, there doesn't appear to be a single day where temperatures will be below average. That is a complete turnaround from the upper 40's we have seen over the last few days. The warmest days will likely be Saturday and Monday. Each of those afternoons will feature temperatures eclipsing the 70-degree mark. A few locations could easily see middle 70's if more sunshine develops than what is currently expected. Even when temperatures don't hit 70°, middle and even upper 60's are forecast across northern Illinois and southern Wisconsin. Sunday will be the coolest day of the next week behind Saturday's cold front. However, upper 50's are still above average for this time of year. Over the course of the next week, the average high temperature will range from roughly 55° to 56°. Additionally, our overnight lows will likely stay at or above 40° through this entire period of warmer weather. There are a few caveats to this warmth, though. First, there will be strong -- at times, very strong -- winds on both Friday and Monday. But it's those strong southerly winds that will be ushering in the warmer air. Secondly, it appears there will be more clouds than sun on most days. That does not mean skies will be overcast, but there will likely not be a day where there will be more sun than clouds. After a few gloomy and cool days in the Stateline the sunshine and warmth returns on Friday. Temperatures have the potential to warm into the upper 60's and low 70's across the area. Even mid 70's just a little south of us. The reason for this will be strong warm air advection ahead of our next low pressure system. The low will track from the northern plains into the upper Great Lakes, while the low will stay north of the area it will still impact our weather in a couple ways. First it's warm front will lift through the region turning our winds to the south west which will help bringing in the warmer air. However, it will be a very windy day with southwest winds that will gust around 30-35mph. With high pressure over Ohio and a fast moving low pressure system over the northern Great Lakes, the pressure gradient (or difference in pressure over a certain distance) will tighten. This in turn strengthens the wind speeds. Winds will increase through the afternoon and stay gusty into the evening. If you're planning to hang out around Wrigley through the afternoon winds will first gust closer to 20 mph around noon and then steadily increase into the early evening. There will be a lot of sunshine though with mostly sunny to partly cloudy skies, and temperatures rising into the upper 60's across the park. 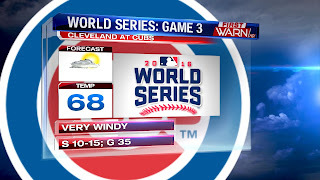 And maybe even the Cubbies will use that SW wind to their advantage and knock a few out of the park! If you are fortunate enough to either have tickets to any of the World Series games this weekend, or if you plan on being in Chicago for the great atmosphere, the weather should cooperate for the most part. For Friday, temperatures will be very mild in the lower 70's under a partly cloudy sky. Skies closer to the first pitch time around 7 PM will be mostly cloudy, but temperatures will still be warm in the upper 60's. In fact, the temperatures shouldn't fall much at all through the game thanks to strong southwesterly winds. Those winds will occasionally gust upwards of 25-35 MPH. And, due to Wrigley Field's orientation, those winds will help fly balls carry on Friday, which could support more home runs and create issues for outfielders. For Saturday's game, temperatures will be noticeably cooler in the middle 50's around first pitch. They will dip into the low 50's by the time the game ends. Skies will be mostly cloudy throughout the game with a 30% chance of showers. Any rain that may fall will be light and scattered in nature, but there certainly is a chance of some shower activity. Sunday's game will be entirely dry under a partly cloudy sky. Temperatures will be jacket-worthy in the low 50's at first pitch. By the game's end, temperatures will be in the upper 40's. GO CUBS GO! Technically speaking, Indian Summer is simply referred to as warm and dry (typically sunny) conditions occurring in late autumn. Many times, it is used only after the first killing freeze of the fall. However, that is not a rule that is written in stone. The other aspect of the definition is that it cannot be one warm and sunny day. It has to be a period of days strung together in a row of warm and sunny conditions. That may occur late this week in the Rockford region. After seeing highs struggling to reach 50° Wednesday, upper 60's and lower 70's -- possibly warmer -- return by Friday and Saturday. The asterisk in the equation will be cloud cover. Skies could very well be partly to mostly cloudy on both afternoons, which technically is not "sunny" as the definition of Indian Summer suggests. Nonetheless, warmer air is set to return for Friday and Saturday behind strong southerly winds. After a brief cool down on Sunday, temperatures are poised to ramp right back up into the upper 60's and lower 70's! That will provide excellent conditions for those heading out and Trick-or-Treating! As it looks now, lower to upper 60's will be present under a mostly cloudy sky during the early evening hours on Monday. Winds will be breezy out of the south, which may cause some of your Halloween decorations to blow around a bit. Otherwise, it looks like a perfect day for Halloween festivities. 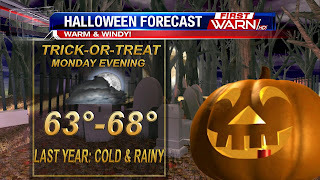 Of course, last year Halloween featured rain and a high temperature of only 52° in Rockford. NOAA (National Oceanic and Atmospheric Association) has released it's 2016-17 winter outlook. This year's outlook is almost an exact reversal of last year's outlook. In terms of temperatures this winter, areas of the south will experience a 30-60% chance of above average temperatures, including most of the western U.S and the southern Plains. While portions of Montana, the Northern Plains, Minnesota, and Wisconsin have a 30-40% probability of experiencing below average temperatures. The Stateline area right now is on track for an average winter in terms of chilly conditions. On the snowy/precipitation side of things, again areas in the west and south have a 30-50% probability of experiencing a drier winter. While those around the Great Lakes and Northwest have about a 30-40% probability of a wetter winter ahead. When we say winter, we mean meteorological winter which includes December, January, and February. But as mentioned above the outlook is almost the reverse of last year's winter outlook, but why? 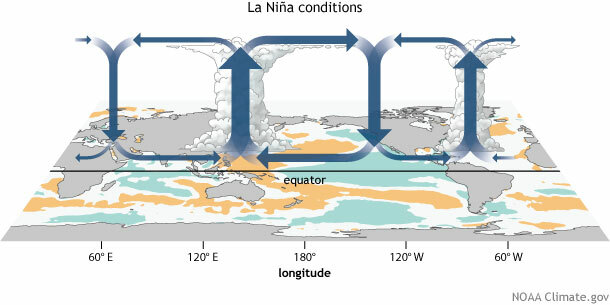 The reason: A transition from El Niño to La Niña. Last year featured a very strong El Niño, which is the warm phase of something called the El Niño Southern Oscillation (also known as ENSO). El Nino is generated by or associated with an area of warm ocean water that develops in the central equatorial Pacific Ocean. La Niña is the opposite of this, and is formed when there are cooler temperatures in the Pacific. This year there is a La Niña Watch for the fall, with a 70% chance that a La Niña will develop. But, confidence is low in this feature lasting through the winter. There is only a 55% chance that it will last through the winter months. Not only does this climate phenomenon correlate to ocean temperatures, but it also requires action in the atmosphere as well. During a La Niña event, the ocean surface in the equatorial regions of the Pacific are cooler than normal. This leads to sinking air and less rain in that region, in turn the waters near Indonesia get warmer and in turn cause rising air and more rain. "This atmospheric circulation works to enhance the cooler ocean surface, both by blowing across the surface just like you’d cool the surface of your coffee, and also by causing cold water from the deep ocean to rise up. Have you ever blown on the surface of a cup of coffee that has cream in it, but hasn’t been stirred up? You’ll see the cream rise up to the surface, brought there by the circulation you’ve created." If you'd like to read more about ENSO click here. As stated in previous articles, just because there a 50/50 chance, of 'average' temperatures expected for our area doesn't mean that we still won't experience mild temperatures and arctic cold snaps at times this winter, these outlooks indicate patterns we look to see and the winter as a whole over the three months. Same goes for any rain or snowy conditions. Just because we could see more snow this year does not mean that there will be extremely large snow events, it just indicates that some climate factors point to there being a more active pattern this winter, thus leading to more snow. We just want to make sure you are prepared for all sorts of winter weather this year! We live in the Midwest so we can expect cold temperatures and snowfall this winter! Cool Start To The World Series! Big game tomorrow night! It looks like the weather will cooperate as well, although it will be much cooler than it was for the Cubs NLCS clinching game on Saturday night! At game time, expect temperatures to be 45 degrees with a light north wind. Calm conditions and cooler temperatures might limit the number of long balls, but our Cubs have been defying those odds all year! The weather for Game 2 on Wednesday could prove to be a little more challenging as there is a 50% chance of rain showers that evening. Temperatures will be a little warmer, but with the moisture it will feel much cooler. Games 3-5 will then move to Chicago where it will be a bit warmer, but there is a chance for rain on Friday. Go Cubs! After a beautiful and warm Sunday, things will start to change come Tuesday. For Monday, though, sunshine will warm temperatures into the upper 50's. By Tuesday, clouds will be on the increase out ahead of an area of low pressure as high pressure pushes to our east. By Tuesday evening, showers become increasingly likely. The showers will be around through the night Tuesday and through the day Wednesday. At times, moderate to briefly heavy rain is possible as low pressure looks to push right overhead. That could also support some thunder and lightning in spots with the rainfall. Not only will it be rainy on Wednesday, but temperatures will struggle to reach the lower 50's and winds will be blustery. By the time all is said and done, rainfall totals could eclipse 1" in many backyards. In fact, some locations could easily see 1.5-2" if some heavy rain does make its way through the region. The good news is we do need some rainfall here in northern Illinois. The bad news is the rain will create for quite the raw day on Wednesday. More than 3/4 of the days in October have been above the normal high for this month, and on average the actual high has been 5 degrees above normal - quite a departure. The Climate Prediction Center has been forecasting for a while now that our Autumn would be warm - and it is proving out. They just released an update to their prediction for November and it looks like the trend will continue. Based on the update, there is a 50% chance that our temperatures will trend above normal, while areas to our Northwest have a little less chance. While these long term predictions can be wrong, they do indicate a general trend and are based on data gathered over many years. Although the fall is predicted to continue to run warm, we may see a shift in the trend as we head into December. The current 3 month outlook for November, December and January shows a trend toward normal temperatures, or equal chances for above or below normal actual readings. NOAA also re-issued a watch for a La Nina (cooler sea surface temperatures in the Eastern Pacific Ocean) to develop (a 70% chance) and also stated that there is a 55% chance those conditions will persist through the entire winter. That normally means colder and wetter conditions for the Midwest. Ideal Weather for Game 6! Ideal conditions for NLCS Game 6 tonight between the Chicago Cubs and Los Angeles Dodgers. At game time the temperature should be a very comfortable 55 degrees and winds will be out of the Southwest at 5-10 MPH. With the wind coming from the Southwest, that will favor some home runs this evening (hopefully mostly from the Cubs!). The winds will counteract the somewhat cool temperatures which might make the ball a little less lively. Temperatures will fall during the game down to about 52 degrees by 10:00. Should the Cubs win tonight they will advance to the World Series for the first time since 1945! The first World Series game is scheduled to be in Cleveland next Tuesday where the weather is forecasted to be clear, but cool with game temperatures likely in the 40's. WARM OCTOBER SO FAR . . . This year's trend toward warmer weather has continued as we are 2/3 of the way through October. Our high temperatures drop at a quick rate on average this month from an average high of 69 degrees on October 1 to an average high of 56 degrees by October 31st. No wonder we typically bundle up for Halloween! But this year might be different. As of today, over 3/4 of our days have had high temperatures above normal and the average departure from normal has been +5 degrees. Quite warm indeed! So it comes a little bit as a shock to our system when we get a couple of days below normal like today and yesterday. While we have had some cool snaps, they have been short lived and so will this cool trend. We will start to warm on Saturday to just above our average high of 60 degrees. Sunday looks even warmer, but a cool front will push through late on Sunday bringing our temperatures back down for the start of next week. While our temperatures look like they will be close to normal next week, it is safe to say we will likely still have a few warm days left yet this fall! Enjoy your weekend. The latest source to publish a winter outlook is arguably the most reliable. That would be the National Oceanic and Atmospheric Administration, or NOAA for short. The outlook features many similarities as the other outlooks that have been published thus far. Namely, a colder and snowier winter is expected across the northern Rockies, northern Plains, Upper Midwest, and Great Lakes. Meanwhile, the southeastern United States and southwestern United States can expect a warmer and drier than average winter overall. The Pacific Northwest will likely see a wetter-than-average winter. The outlook shown is valid for the months of December, January and February, not November and March. While NOAA's outlook doesn't feature brutal cold or hefty snowfall totals across the northern Illinois and southern Wisconsin region, it does point towards the Rockford area seeing above average snowfall and roughly average temperatures. However, because our temperatures aren't expected to be well-above or well-below average, that does not mean we won't experience periods of frigid air, or days where temperatures soar above average. Temperature fluctuations can and do occur at all times of the year, including winter. That holds true even when a winter is expected to be brutally cold. There will still be a few days with warmer-than-average temperatures. Is it a guarantee that any particular winter outlook will validate perfectly? Certainly not. However, there has been at least minimal agreement among the winter outlooks overall. That suggests that Rockford does have a higher probability of seeing a snowier and slightly colder than average winter as opposed to a warmer-than-average and drier than normal winter. Frosty Nights; Why No Freeze Warnings? For the third time this fall, a Frost Advisory is in effect for the entire Stateline. That means the formation of frost is likely in most backyards tonight into early Friday morning. Temperatures are expected to remain just above the freezing mark in many spots, but a few locations in Jo Daviess, Carroll, Stephenson, Green, and Rock Counties could see temperatures in the 30-32° range. Technically that is considered freezing, but the National Weather Service is not issuing Freeze Warnings. Instead, they are sticking with Frost Advisories. Why is that? The NWS won't issue Freeze Warnings unless a widespread freeze event is expected across a particular county. In other words, unless the NWS is confident that a majority of any given county will experience temperatures below 32°, they won't issue a Freeze Warning. For tonight, some parts of Jo Daviess, Carroll, Stephenson, Green, and Rock Counties will likely dip to 32°, if not lower. However, each of those counties will likely have many locations that stay at 33° or above tonight. Thus, a Frost Advisory in effect despite some locations likely seeing a freeze event tonight. If a widespread freeze event is anticipated, a Freeze Warning will be issued. Thus far this fall, temperatures have not met the guidelines for a Freeze Watch/Warning. It doesn't look likely that we will meet Freeze Warning credentials for the next week or so, per the latest forecast models. Once temperatures are forecast to drop to 32° or lower for most of any given county, a Freeze Warning will be issued. And, once the first "widespread" freeze event occurs in a given area, the growing season officially comes to an end. As a result, Frost Advisories and Freeze Watches/Warnings will no longer be issued. Frost Advisories and Freeze Watches/Warnings are only used in the fall until a killing freeze event occurs. They are used in the spring when it is late enough to cause damage to new crops and plants. 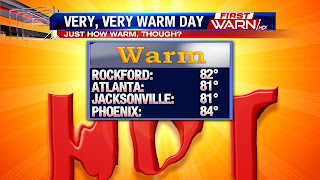 Earlier in the week we hit 84° in Rockford. Many areas hit the 85-86° range! 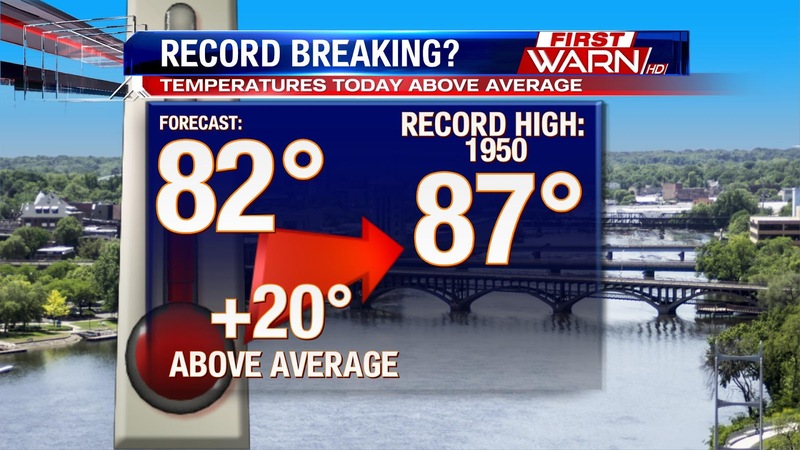 While a record was not broken regarding high temperatures, those numbers were over 20° above average. A cold front swung through the region early Tuesday morning, which kept our temperatures in the middle 70's Tuesday afternoon. That is still about 15° above average for this time of year. On Wednesday we saw plenty of cloud cover and even some showers, but our temperatures still reached 70°! Temperatures may not hit values this high for quite some time as we head towards November. High temperatures Thursday and Friday will likely be confined to the 50's. That means we will finally see a pair of days with below-average temperatures here in the Stateline area. Overnight lows Thursday night and Friday night will also be much lower than what we have been treated to lately. FutureCast suggests temperatures Friday morning could be in the middle and even lower 30's. That will likely result in a Frost Advisory for the entire region. It wouldn't be a complete surprise to see a Freeze Watch or Freeze Warning if models continue to advertise overnight lows in the 30-32° range in spots. If you are a fan of astronomy and astrology, you will not want to miss what is in store on October 20th and 21st. The Orionid Meteor Shower will peak across the globe on these days. This year astronomers are anticipating 15-20 meteors to cross the sky every hour. That may not seem like a lot. In fact, some years 70-80 meteors can be seen each hour with this meteor shower. However, the Orionid Meteor Shower is known for having some of the brightest and fastest meteors, also known as shooting stars. That means the meteors will easily be seen via the naked eye. In order to get the best view of them, though, you should venture away from city centers and light pollution. The best places to see events like these are rural locations where minimal to no buildings exist. The darker it is, the better chance you have of seeing the show. The best time to see the meteors will be Thursday morning and Friday morning, shortly before dawn. That is when the constellation Orion will be low in the eastern sky. Meteors will not be confined to appearing near Orion, however. These meteors are exceptionally special because they are pieces of Halley's Comet, which only swings by Earth every 75-76 years. This particular meteor shower occurs annually. So while you may only get to see Halley's Comet once in a lifetime, you can see meteors that originate from the Comet each year via the light show called the Orionid Meteor Shower. And the great news for northern Illinois and southern Wisconsin is skies should be mainly clear Thursday night and Friday morning. That will allow for excellent viewing conditions for the entire region! Minimal Rain this Week....But We Need It. After a few downpours and storms this past weekend, the weather pattern this week remains quiet. Active jet to the north has kept much of the storm potential in northern Wisconsin this week, along with a lot of the moisture. So while this morning we have a 'lifting mechanism' (aka the cold front) we don't have much moisture to work with. Because of that, we really just see clouds arrive through the mid to late morning. Another front will pass through Wednesday and that could bring a few isolated showers Wednesday into Thursday, but again we won't see much in terms of accumulation. We need the rain however, typically by this point in October we have picked up about an inch and a half of rain, but overall for Rockford we're running an inch in deficit. So far we've picked up only 0.44" in the rain gauge. Temperatures on Monday soared into the 80's during the afternoon hours. 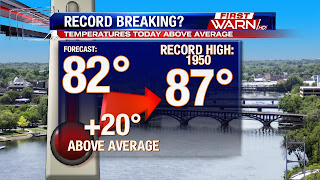 In fact, Sterling reached 86°, Rockford hit 84°, and many locations saw 83-85°. Those numbers were not record highs, but they were very close. Add the humidity into the equation, and many would classify Monday afternoon as down-right hot! Dew points reached the middle and even upper 60's, which is considered "humid." Essentially, Monday's air mass would be typical of July or August when considering the temperatures and humidity. We can thank strong southerly winds at 15-30mph for ushering in the heat and humidity. These kinds of temperatures won't be seen again until possibly next year. At a time this afternoon, Rockford's temperature was warmer than both Atlanta and Jacksonville. Not only that, but our temperatures were only a couple degrees off of what areas such as Phoenix and Miami saw this afternoon! Those are all cities typically associated with much warmer weather than what we see in northern Illinois. In terms of records, we did break one by 7°! It wasn't the record high for October 17th. The record we broke is the warmest overnight low temperature for the date. 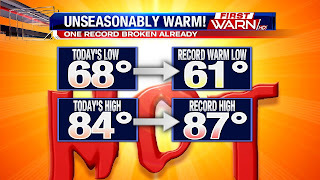 We only dropped down to 68° Monday morning, which is 7° higher than the previous warmest low temperature for the date! This morning's low was 6° warmer than our average high temperature for this date! The record high for the date is 87° at the Rockford airport. 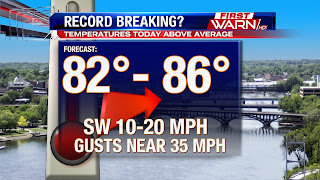 While we didn't reach that number, we came very close by topping out at 84°. Some locations in the Stateline (Sterling, Rock Falls, Savanna, Amboy) did see 86° or 87° this afternoon. Temperatures won't be anywhere near today's values in the foreseeable future. If you haven't been able to let summer go, you'll enjoy the forecast today. We get another shot at the 80's today despite partly sunny skies. It will be a windy day though, and that will help our temperatures climb. You'll notice the breezy winds from the southwest sustained at 10-20 mph and gusting as high as 35 mph. Temperatures today will climb into the low 80's and even mid 80's just a bit farther south of Rockford. 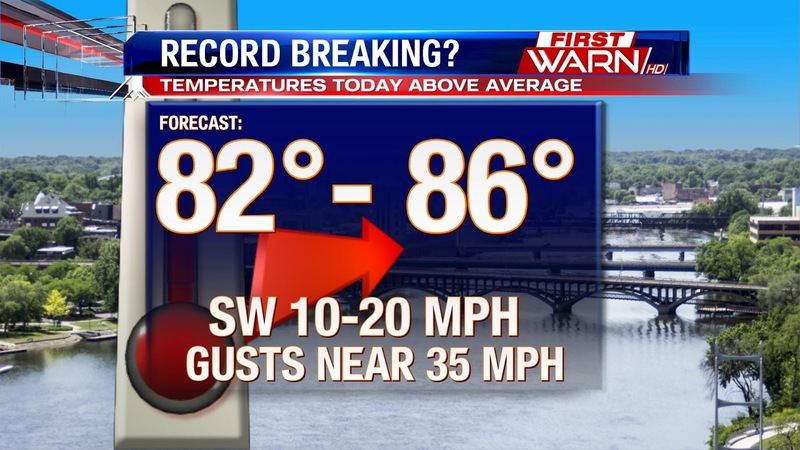 It may be a bit of a stretch to break the record, which is 87° set back in 1950. However, the forecast high is 82° and if we make it there, our temperature will be 20° above the average for this time of year. To put that into perspective, our overnight low's this morning, near 70°, were warmer than the average high ( of 62°) we should be seeing. While we will be much above average today, the temperature trend goes down through the week, and we could end up below the average by Thursday and Friday. Temperatures will drop into the upper 50's and low 60's by the end of the week and stay steady in the low 60's this weekend. So whether you are a fan of summer or fall, this week's forecast features something for everyone! A few lighter showers are already popping up in the far northwestern portion of the Stateline. We'll see scattered showers this evening, but the storm potential really goes up overnight closer to midnight. This is when the cold front will be pushing through, along with the most instability available. But with the cloudy skies that stuck around through the afternoon, there hasn't been much instability generated. We will mainly see scattered to widespread showers this evening with isolated storms as well. Severe storms aren't in the forecast for this evening, but a few gusty winds and heavy downpours will be possible. If you're heading out early Sunday you'll want to keep the umbrella handy with a few showers and storms lingering into the morning hours. However, most of the activity will be out of the area by about noon Sunday afternoon. The rest of the afternoon remains cloudy with highs in the low 70's. Believe it or not, there is a threat for thunderstorms in the forecast this weekend. Not only that, but some of the storms could be strong or perhaps even severe in nature. A cold front will approach the region Saturday afternoon. Ahead of it we will warm into the lower 70's with dew points surging into the lower 60's by Saturday night. Our gusty southerly winds at 15-25mph will allow for those two things to occur. Once the front arrives later Saturday evening, showers and thunderstorms are likely going to fire ahead of it in Wisconsin, Iowa and northern Missouri. 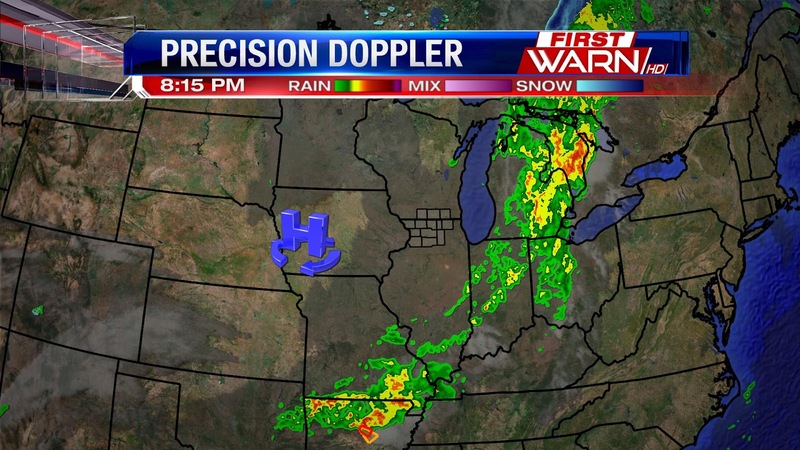 That activity will progress eastward towards the Stateline through the overnight hours. In all likelihood, there will be some thunderstorms holding their own as they cross the Mississippi River and enter Illinois. The golden question still remains: "Will severe weather occur?" That question is difficult to answer with complete accuracy. 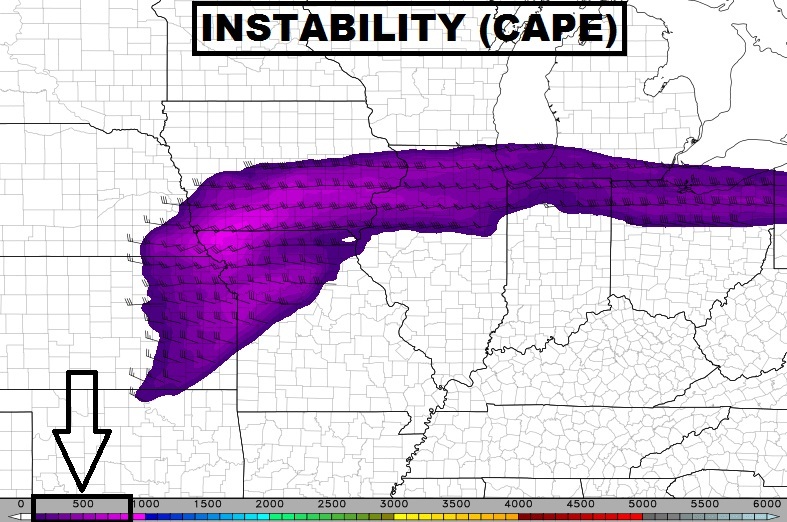 However, forecast models are in good agreement with drawing in a thin ribbon of instability (CAPE) Saturday night. Strong low-level winds several thousand feet above the ground will allow the storms to maintain their intensity through the night. In addition, moisture will be drawn in from the Gulf of Mexico. These components are supportive of strong to marginally severe thunderstorms. That is why the Storm Prediction Center has placed half of the area under a "Marginal Risk" for severe weather late Saturday evening. The main threats will be gusty winds and marginally severe hail. Will everyone get in on the thunderstorm action? No. Is severe weather a guarantee? Definitely not. It is certainly possible, though, due to the variables we will have in place. We're in the midst of fall, and if you're anything like me, you appreciate the fall colors here in the Midwest. If you're planning a trip to check out the fall colors, central Wisconsin is a good area to check out a long with a few areas in northern Wisconsin. Currently, most of northern Wisconsin is at or a bit past peak colors. Central Wisconsin features about 50-75% percent of peak colors, while the southern portion of the state is at about 25-50%. For northern Illinois we're noticing patchy colors and will most likely reach peak colors in mid to late October. And if you're running late, southern Illinois on average reaches peak colors in the beginning to middle of November. You've still got time if you are planning a trip to check out the colors! The weather this weekend will be warmer in the 70's. We'll want to watch for showers and storms overnight Saturday into Sunday. A few showers and storms possible Sunday afternoon. If you enjoyed the 70's we received earlier this week, then you are in luck! That is because despite the pair of frosty nights this week, we will return to the 70's and perhaps 80's this weekend and next week. A sharp cold front took our 70's and slashed them into 50's Thursday afternoon. That front also delivered the first area-wide frost event Wednesday night. Another frost event is expected Thursday night as a Frost Advisory is again in effect for every county aside from Whiteside. However, as high pressure slips into New England by Saturday, winds will turn southerly this weekend and early next week. And, we all know what southerly winds mean! That's right! Warmer air in the form of 70's and perhaps lower 80's will be in place from Saturday through Tuesday. Middle to upper 70's are likely this weekend with lower 80's on Monday. A cold front will lead to an abrupt end of the warmth Tuesday night. Not before we string together four straight days of high temperatures 10-20° above average for this time of year! The potentially warmth-limiting factor that needs to be monitored is extensive cloud cover. If we see more clouds on either of the four days, we could be looking at lower high temperatures than currently expected. But, as it looks as of Thursday evening, middle and upper 70's are a good bet this weekend into next week. And, as shown on the graphic, low 80's cannot be ruled out for Monday behind strong southwesterly winds! We get to enjoy a few days with a fall feel, and dry skies along with it. Dominating high pressure and a trough in the upper levels of the atmosphere are responsible for this colder than average shot of air. That trough though is already pivoting east, and despite another cold start tomorrow morning with potential again for frost, temperatures Friday will rebound quickly back to average. The pattern turns a bit more active into next week, with a few scattered rain chances in the forecast. However, it will depend a lot on the position of the jet stream across the country. Right now, this looks to be centered close to the Canadian border, which would keep a lot of the activity north of us. It would also support temperatures warming well above average. Temperatures by the start of next week could make it into the upper 70's before a cold front by the middle of the week drops temperatures closer to average. We can also expect showers and storms to be possible Saturday night into Sunday. This arrives with a shortwave in the jet that will be moving close to the Canadian border, and it's trailing cold front. Before the front arrives, temperatures on Saturday will warm into the low 70's. But, if we can get the moisture to lag a bit that would keep the clouds at bay. If we get more sunshine, temperatures would have the ability to warm into the upper 70's. That front then lifts back north through Sunday. There is a somewhat smaller chance for storms through Sunday, but rain is the most likely Saturday evening. The weekend doesn't look to be a total washout with most of Saturday dry and then smaller scattered chances by Sunday. What a wild Wednesday in the weather department! We saw warm temperatures, cold temperatures, windy conditions, rain, mist, a few peaks of sun, and plenty of cloud cover. In fact, our temperatures in Rockford fell from 67° shortly before noon to 48° at 8pm! That is nearly a 20-degree drop in just about eight hours. We can thank a powerful fall cold front for bringing in the colder air and rain showers. The good news is we didn't see a lot of rain, but it was around for a good portion of the day. Now we shift our attention to the west. That is where a dome of high pressure is located Wednesday evening. It will slide overhead Thursday night before moving east by Friday. That high will deliver very chilly conditions Wednesday night and Thursday night. Temperatures each night will be in the middle and upper 30's. However, lower 30's are a real possibility in rural and outlying areas. 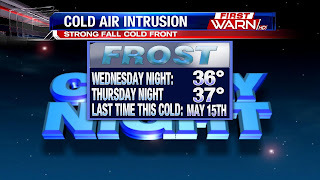 A Frost Advisory is in effect Wednesday night, and one may be issued for Thursday night as well. That advisory does not include Whiteside, Lee, DeKalb, or McHenry Counties. It is effective from 2am-9am Thursday morning. And, with the threat of frost in the forecast, it's important to remember to cover up or bring inside those tender plants. The area of high pressure won't only bring cooler air into the Stateline, but it will give way to clear skies both Thursday and Friday. That means abundant sunshine each afternoon, which will help make the cooler temperatures feel a little warmer. For Thursday, sunshine will only warm us into the middle 50's, but a light wind will make it feel a little warmer. Friday we can expect to see the same thing, but temperatures will be even warmer in the middle 60's as winds begin to strengthen late in the day out of the southwest. The sunshine and cooler temperatures don't last, though. The 70's return by the weekend, as do multiple chances of rain and thunderstorms. So if you want to get any outdoor work done, use Thursday and Friday! The season's first frost is expected tonight as overnight lows drop into the low to mid 30's. The National Weather Service has issued a Frost Advisory for Green, Rock, Walworth, Jo Daviess, Stephenson, Winnebago, Boone, Ogle, and Carroll counties from 2am - 9am Thursday morning. Clear skies, cold air, and lighter winds will allow temperatures to fall and frost to develop. You'll want to cover any sensitive plants before you head to bed. That cold front is currently in far northwestern Illinois and is sinking to the southeast. This is already switching our winds from the south to the north and ushering in colder air. Temperatures will reach their highs around 10am and then will fall through the 50's throughout the afternoon. Highs Thursday will only make it into the mid 50's despite abundant sunshine, as an arctic high is settled overhead. We could actually see frost develop again Thursday night into Friday morning as temperatures fall into the mid 30's once again. However, the cold air won't be as strong, so the frost will be contained to more outlying and low lying areas Friday morning. Good news is, the weekend kicks off a string of 70's! We hit 77° on Tuesday afternoon. That is good for 13° above average. Hopefully you were able to enjoy it because we won't see upper 70's until potentially early next week. That's because a strong fall cold front will move through on Wednesday morning, ushering in much colder air. Before it moves through, though, we will see some rain and potentially a few rumbles of thunder Wednesday morning into the afternoon. The rain won't be particularly heavy, nor is severe weather expected in our region. There is a minimal threat, however, of severe thunderstorms to our south near Springfield and Peoria. Rain totals locally will approach the one-half inch mark in many locations, but this particular model shown may be overdoing things just a bit in the rainfall department. Behind the rain, skies clear into Wednesday evening. Those clear skies, combined with an incoming area of high pressure, will supply ideal conditions for temperatures to fall far. By Thursday morning, temperatures will be in the middle and upper 30's. That will be cold enough to support some frost. Some of the forecast models even point towards overnight lows in the lower 30's! Thursday night we will likely fall right back down into the middle 30's in many locations, which again will support some areas of frost. So it's time to cover up the tender vegetation! Feeling the Chill in October? Will a Warm September Lead into a Warm October?